What could be better than going to one of the best neighborhood restaurants with the best neighbors? Having eaten at The Blue Plate only once prior, for my second visit I tried many new dishes on the menu. We started off with the grilled local sardines with marinated green tomato, chile-candied kumquat, and tarragon. Also, we shared a star canyon baby kale salad with bing cherries and pickled red onion in a pecorino vinaigrette, then sprinkled with bread crumbs. 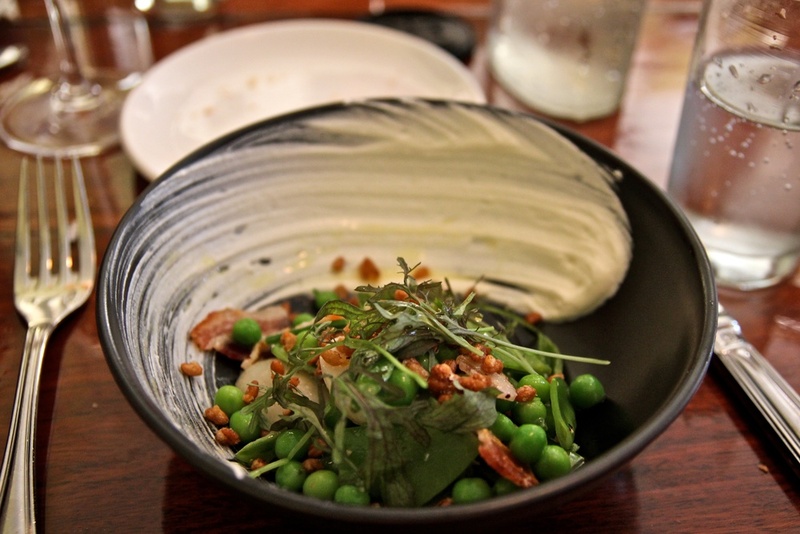 The summery English pea salad, both ornamental and tasty, was made with house-made ricotta, tokyo turnips, pancetta, and crispy farro. The other summer-inspired vegetarian dish was the grilled asparagus with harissa-citrus oil, and Meyer lemon. As is the trend with many the restaurants in SF, The Blue Plate changes its menu based on the seasons so as to always use fresh, high-quality ingredients. I even resisted the temptation to order my favorite dish from my first visit was was the grilled Monterey Bay squid with pope’s beans, Meyer lemon, and Calabrian chile aioli. The only thing on the menu that I ordered last time that I had to try again was the macaroni and drunken Spanish goat cheese. Baked in the oven to give it a brown crust and gooey inside, this mac ‘n’ cheese is one of the best mac ‘n’ cheeses that I have ever had. For the main course we shared the house-made pappardelle with fava beans, sweet corn, sheep’s milk cheese with summer truffle. Fava beans are by far one of my favorite summer ingredients. The pan-roasted skuna bay salmon with sofrito, summer squash, smoked green olive, white anchovy mayonnaise. In incandescent salmon skin reflected the sun’s rays that penetrated through the adjacent glass window. It is a good idea to leave some room for dessert here as well. The mixed berry pie in the buttery, crumbly crust and the butterscotch pudding with pecan brittle was the perfect way to finish off the meal on an usually warm night for San Francisco.